Last week we discussed Normalized Difference Vegetation Index (NDVI) sampling across a range of scales both in space and in time, from satellites sampling the entire earth’s surface to handheld small sensors that measure individual plants or even leaves (see part 1). This week, learn about NDVI applications, limitations, and how to correct for those limitations. Limitations of the Normalized Difference Vegetation Index tend to occur at the extremes of the spectrum. People use NDVI to infer things like leaf area index (LAI) or fractional light interception (FPAR) of a canopy. 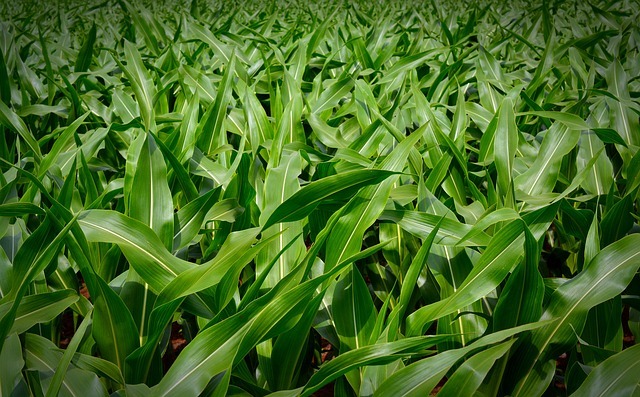 Some scientists also associate NDVI with biomass or yield of a crop. People also use NDVI to get a sense of phenology (general temporal patterns of greenness), as well as where vegetation occurs or how much vegetation is in a particular location. In Figure 4, you can see how the reflectance spectrum at a given canopy LAI changes with leaf area index, decreasing in the visible range while increasing in the near infrared. At very low LAI’s, the reflectance spectrum is relatively undifferentiated between red and NIR (black line), but when LAI is high, there’s a strong absorption of red light by chlorophyll with a strong reflectance in the NIR. In fact, as LAI increases, there’s an ever-increasing reflectance in the near infrared around 800 nm. Limitations of the Normalized Difference Vegetation Index tend to occur at the extremes of the spectrum. Any time there’s very low vegetation cover (majority of the scene is soil), NDVI will be sensitive to that soil. This can confound measurements. On the other extreme, where there’s a large amount of vegetation, NDVI tends to saturate. Notice the negligible difference between spectra at a leaf area index (LAI) of 3 (purple) versus 6 (green). Indeed, in a tropical forest, NDVI will not be sensitive to small changes in the LAI because LAI is already very high. However, several solutions exist. 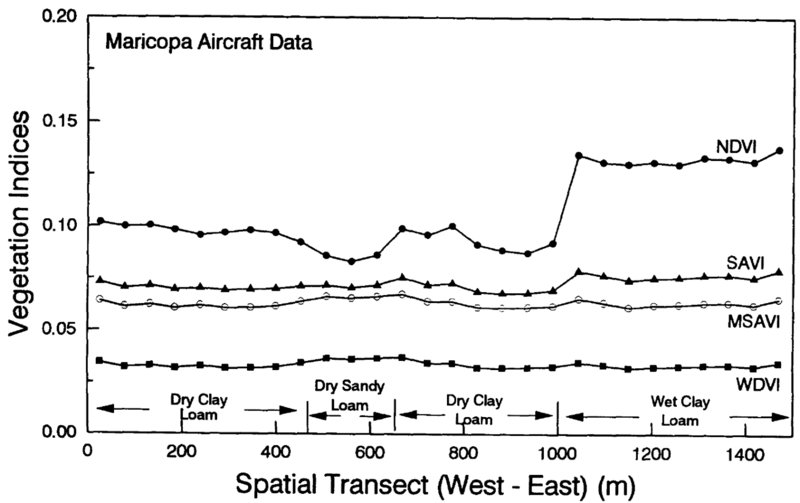 Figure 5 shows the results of a study taking spectral measurements of different vegetation indices across a transect of bare soil. Moving from dry clay loam to wet clay loam, we see a very strong response of NDVI due to the wetness of the soil; undesirable if we’re measuring vegetation. 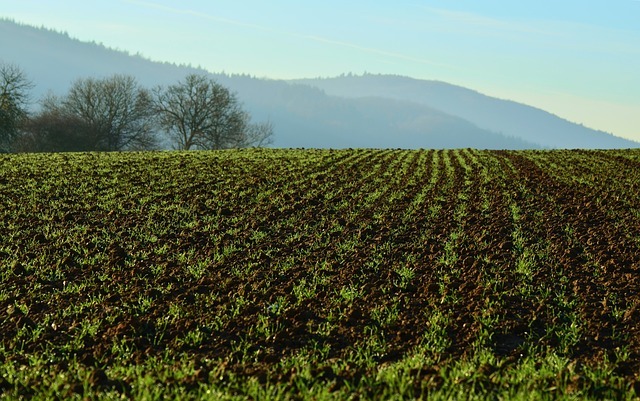 We’re not interested in an index that’s sensitive to changes in soil or soil moisture. However, there are a few other indices plotted in figure 5 with much lower sensitivities to variations in the soil across the transect. Figure 5: Qi et al. (1994) Rem. Sens. Env. The first one of those indices is the Soil Adjusted Vegetation Index (SAVI). The equation for SAVI is similar to NDVI. It incorporates the same two bands as the NDVI—the near infrared and the red. The only thing that’s different, is the L parameter. L is a soil adjustment factor with values that range anywhere from 0 to 1. When vegetation cover is 100%, L is 0 because there’s no need for a soil background adjustment. However, when vegetation cover is very low, that L parameter will approach one. Because it is difficult to measure exactly how much vegetation cover you have without using NDVI, we can modify the NDVI so it’s not sensitive to soil by guessing beforehand what L should be. It’s common practice to set L to an intermediate value of 0.5. You can see in Figure 5 the Soil Adjusted Vegetation Index or SAVI has a much lower sensitivity to the soil background. The next vegetation index is the modified SAVI (MSAVI). The SAVI equation contains an L parameter that we have to estimate—not an accurate way of handling things. So a scientist named Key developed a universal optimum for L. We won’t get into the math, but he was able to simplify the SAVI equation to where there’s no longer a need for the L parameter, and the only inputs required are the reflectances in the near infrared and the red. 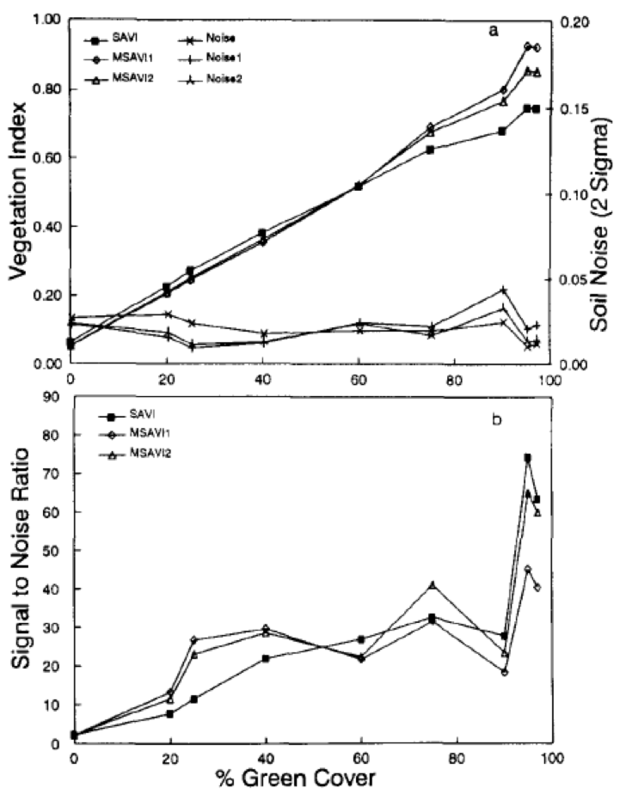 This was a pretty significant advance as it circumvented the need to estimate or independently measure L. When Key compared SAVI to MSAVI, there was virtually no difference between the two indices in terms of their sensitivity to the amount of vegetation and their response to the soil background. Next week: Learn about solutions for high LAI.